All summer I have trained with the following products: Ironman Perform powder, Gu Roctane, Gatorade, and Gu Brew. 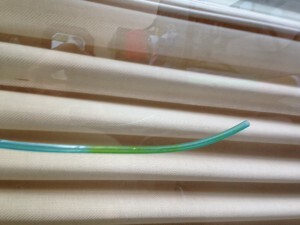 Never did my straw change colors that look like this one after using the fluids at Ironman last week. This lead me to ask around to some that also raced last weekend and I found everybody I talked to had major issues with it causing nausea, vomiting and other GI issues. 1.) The sugar in the drink was not the same sugar used in the powder (that I trained with over the summer). They state that this is very likely, but if the drink was made properly it should taste the same and one’s body should react the same whether it is powder, concentrate or premixed beverage. This is why the companies spend millions on testing products of different formulations. 2.) The drinks came from a bad batch. This is highly unlikely since the problems were so widespread with multiple athlestes taking bottles from different aid stations. 3.) The sugars that were used were a low grade sugar. This would explain getting sick but not the staining of the straw. 4.) The product was skunked, not expired, but skunked. If the product was left out in the hot sun and repeatedly heated up to a high temperature and cooled that complex sugars will start to decompose and their molecular compound will change. This may have been the reason that the Yellow dye stained your straw and whey everybody got sick.